CMH’s Sheryl Fisher (center) with Murphy Theatre representatives Maretta Alden and David Wagenseller. 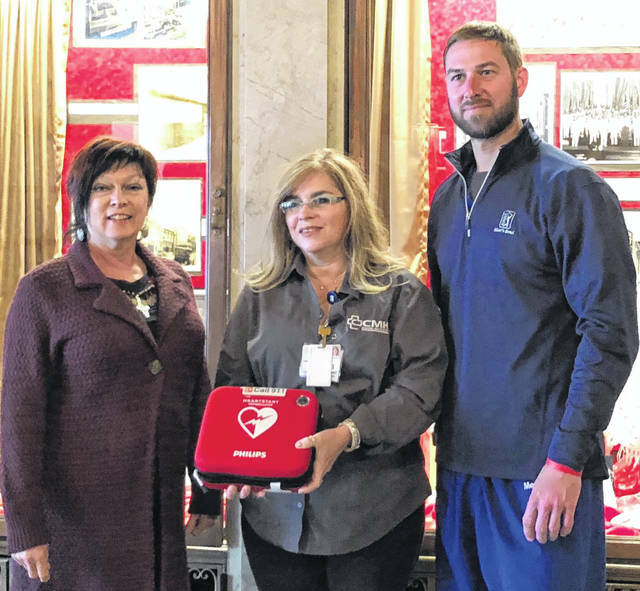 WILMINGTON — Cheryl Fisher with CMH presented an AED (Automated External Defibrillator) to Murphy Theatre representatives David Wagenseller and Maretta Alden. “We are happy to provide the AED to help ensure the safety of theater patrons as part of our commitment to our community,” Fisher said. An AED is used to help those experiencing sudden cardiac arrest. It’s a sophisticated, yet easy-to-use medical device that can analyze the heart’s rhythm and, if necessary, deliver an electrical shock, or defibrillation, to help the heart re-establish an effective rhythm. CMH Regional Health System is a community network of healthcare providers and services dedicated to the highest quality of patient care. For more information, visit www.cmhregional.com.